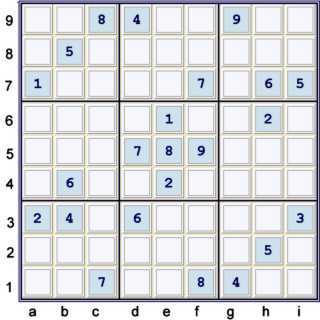 The following illustrated solution for the Tough Sudoku of May 25, 2009 employs at least some steps of some interest, perhaps, to some. 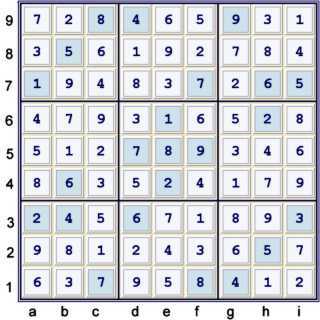 Although this sudoku can be solved without using the uniqueness deduction illustrated below, in my opinion the uniqueness deduction simplifies the solution. 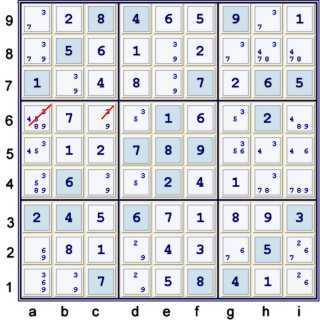 This Sudoku probably solves with fewer steps. The steps chosen below are primarily for the purpose of teaching and illustration. I realize it is a bit grandiose of me to assume that I might do either well. 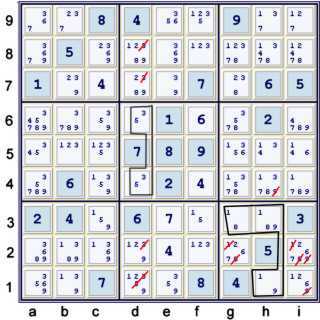 For those whom do not wish to struggle through the illustrations, I have written the steps taken in this solution at the bottom of the page in sudoku.com.au notation. Five Unique Possibilities (UPs) are available here. One may note that many of the steps shown here could have been done in a different order, such as the next step. Step 4: A continuous loop, or wrap-around chain, using candidates 2 & 5. 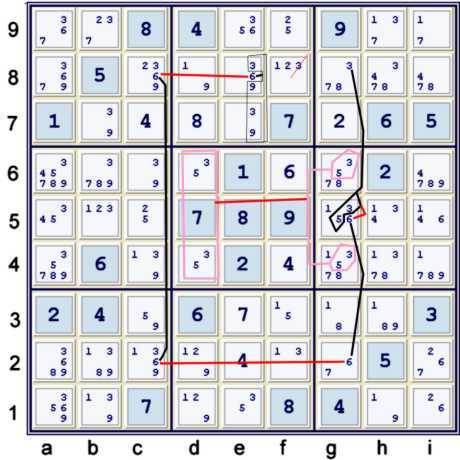 Short wrap-around chains such as the one illustrated below are my absolute favorite find while solving a sudoku. They illustrate the power of AIC's best, and avoid having to consider the same information multiple times to achieve multiple eliminations. But, enough with the inane preaching! The first two steps have set up this step. The 2's at d78 above are eliminated because of the locked candidate (2) at f89, and normally would not be considered to be a result of such a chain. Please note that it matters not where one would start the following chain. Each potential starting point is completely arbitrary! I have been told many times by my wife that I am also completely arbitrary, but I think her meaning is slightly different. Step 5: Another short chain that finally yields an elimination which allows some cells to be solved. My step 8 is available now. However, first I will dispense of a couple of other candidates to get more bang for the buck. Again, this is another one of those arbitrary decisions. Step 7: Another Ywing Style, this time using a mixture of hidden and naked strengths. One could now use the locked 9's at d12. Doing so, or not doing so, will not matter after the next step. Step 8: Uses a Almost Unique Rectangle Strong Inference Set in a chain. 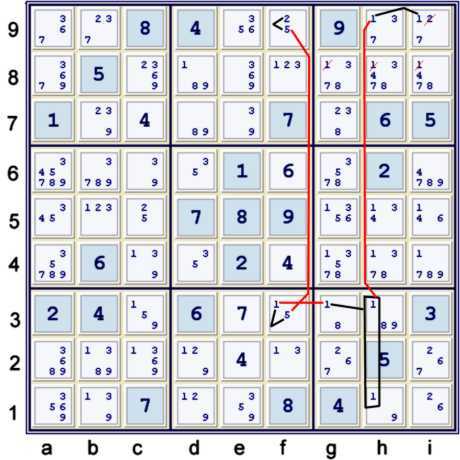 The chain below is the longest chain of this solution. It has been available since 3 was removed from g7. Oftentimes, the use of hidden strengths in conjunction with a Uniqueness situation can be powerful, as illustrated below. 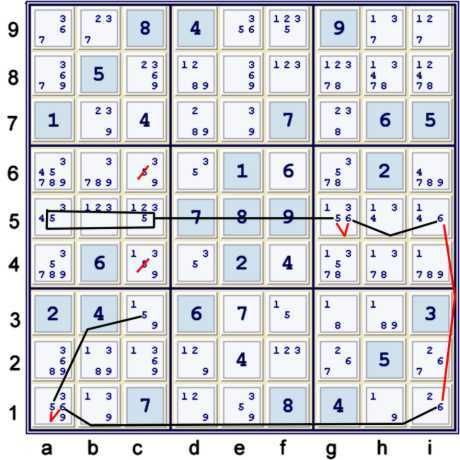 The grouping (35-6)g5 merely means that (3)g5 and/or (5)g5 are weakly linked, or forbid, or prevent, (6)g5. A lowly naked pair suffices to knock out the rest of this puzzle.